Gekommen um zu bleiben - nabu-hennebergerlands Webseite! 15 - 10 - 5 Das ist eine magische Zahlenreihe! 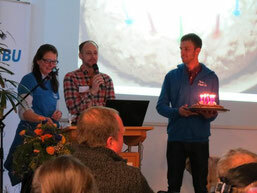 15 Jahre Wölfe in Deutschland; 10 Jahre NABU Projekt "Willkommen Wolf" und 5 Jahre Wolfsbotschafter. Wenn diese Jubiläen kein Grund zum Feiern wären! Beim 7. Wolfsbotschaftertreffen in Berlin gab es schon solch eine Feierstimmung. Jeder hatte Ideen, wie er auf die magische Zahlenreihe aufmerksam machen will. In der Diskussion gab es neue Impulse. Da war ich froh, dass auch ich bereits mit konkreten Vorstellungen aufwarten konnte. Doch darüber berichte ich zu einem späteren Zeitpunkt. Schön für mich war zu hören, dass der NABU die einzige Organisation ist, die die Belange der Menschen in den Mittelpunkt stellt und damit dem Wolf eine Überlebenschance hier bei uns gibt. Stolz sind wir in Thüringen natürlich auf "unsere" Wölfin. Aber auch die NRWler sind stolz, dass bei ihnen auch nun ein Wolf nachgewiesen werden konnte. 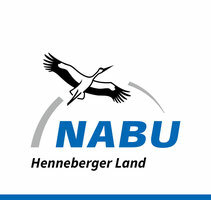 Wer unter Termine rein schaut, weiß, was der NABU Henneberger Land zum 15 - 10 - 5 Jubiläum plant. Quality articles or reviews is the crucial to interest the users to go to see the web page, that's what this site is providing. Greetings from Los angeles! I'm bored to death at work so I decided to check out your site on my iphone during lunch break. I really like the info you present here and can't wait to take a look when I get home. I'm amazed at how quick your blog loaded on my mobile .. I'm not even using WIFI, just 3G .. Anyways, fantastic blog! Hello, i believe that i noticed you visited my site so i got here to return the want?.I am attempting to find things to improve my web site!I suppose its adequate to make use of a few of your ideas!! When I originally commented I seem to have clicked the -Notify me when new comments are added- checkbox and from now on every time a comment is added I recieve 4 emails with the same comment. Perhaps there is a means you are able to remove me from that service? Thanks! Hi, I do think this is a great site. I stumbledupon it ;) I am going to come back yet again since i have bookmarked it. Money and freedom is the greatest way to change, may you be rich and continue to guide other people. Hi there, just became alert to your blog through Google, and found that it's truly informative. I'm going to watch out for brussels. I will be grateful if you continue this in future. A lot of people will be benefited from your writing. Cheers! Great site. Lots of useful info here. I'm sending it to several buddies ans additionally sharing in delicious. And of course, thanks to your sweat! When someone writes an piece of writing he/she retains the idea of a user in his/her mind that how a user can know it. Thus that's why this article is perfect. Thanks!